The type of ownership of residential long-term care facilities for frail seniors is a determinant of the quality of care provided. Analysis comparing the US and Canadian research on the ownership and quality of services in these facilities concludes that for-profit facilities are less likely to provide quality care than nonprofit or public facilities. 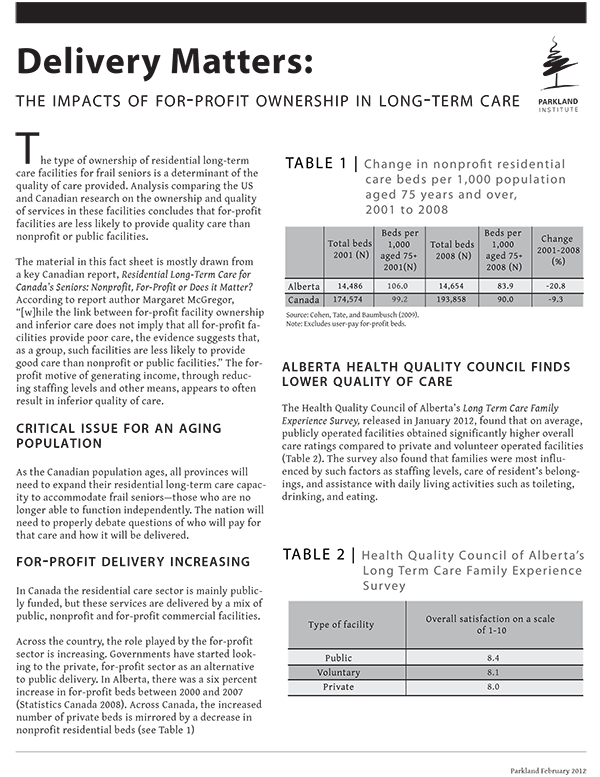 The material in this fact sheet is drawn mostly from a key Canadian report, Residential Long-Term Care for Canada’s Seniors: Nonprofit, For-Profit or Does it Matter? According to report author Margaret McGregor, "[w]hile the link between for-profit facility ownership and inferior care does not imply that all for-profit facilities provide poor care, the evidence suggests that, as a group, such facilities are less likely to provide good care than nonprofit or public facilities.” The for-profit motive of generating income, through reducing staffing levels and other means, appears to often result in inferior quality of care.